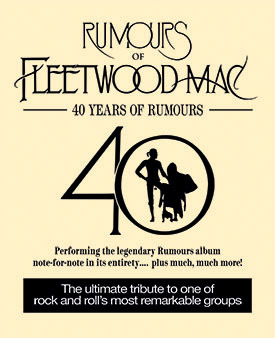 Performing the legendary Rumours album note-for-note and in its entirety... plus much much more! Rumours of Fleetwood Mac, the world�s finest tribute to Fleetwood Mac, comes to North America for the very first time in 2018 with a brand new show celebrating 40 years of the iconic Rumours album. Encompassing nearly five decades of legendary music and channeling the spirit of Fleetwood Mac at their very best, Rumours of Fleetwood Mac offer a unique opportunity for fans, both old and new, to rediscover the songs and performances that have ensured Fleetwood Mac�s place as one of the most loved bands of all time. Personally endorsed by Fleetwood Mac founding member, Mick Fleetwood, Rumours of Fleetwood Mac is the ultimate tribute to one of rock and roll�s most remarkable groups. "A stunning and incredibly accurate snapshot of the World�s first Super Group"